Bow the warlock belongs to Ranged DPS, positioning is Ranged, limited break effect is group respond to HP. Bow warlock has strong maneuverability, the reason is that he can move and attack and can move without breaking when cast attack skills, at the same time have a control skills. Bow warlock corresponding superior professional for bard, promotion condition: bow warlock levels 30 and satisfy an enchanter 15. Characteristics: divided into GCD and non-public CD skills. Total CD skills is refers to the general public of cooling, is refers to the skills of those who cannot use at the same time, rather than the GCD skills, on the other hand, there is no global cooldown, can be used in conjunction with other skills. Other skills bow warlock consumption for TP consumption not drains MP. TP for 1000, every time a certain amount in battle. Skills: a Heavy Shot: main attack skills, output effect is direct damage, ability damage, ability damage is not the actual damage, as for the skills in proportion to the damage and the actual damage reduction is not clear, the same below.) For 150. Cooperate with passive skills can lead to improve the skills of crit rate. Skills 2: Straight Shot: the buff skills plus attack damage. Skill damage for 140, buff effect to improve own crit rate, duration of 20 s.
Three skills: held Strikes: with a buff skill. Longer CD180S, have passive skills can reduce the CD to the 120 s. Effect of damage is increased by 20%, duration of 20 s.
Four skills: Venomous Bite (poisonous) : (although this skill can be understood as a WOW of a hunter’s serpent sting, but I want to say I hope everybody can make FF14 an all-new game, give up you will find more happiness in FF14 warcraft convention.) To direct damage sustained damage skills and direct damage by 100, plus 8 s sustained damage, can prolong sustained damage to 18 s passive skill. 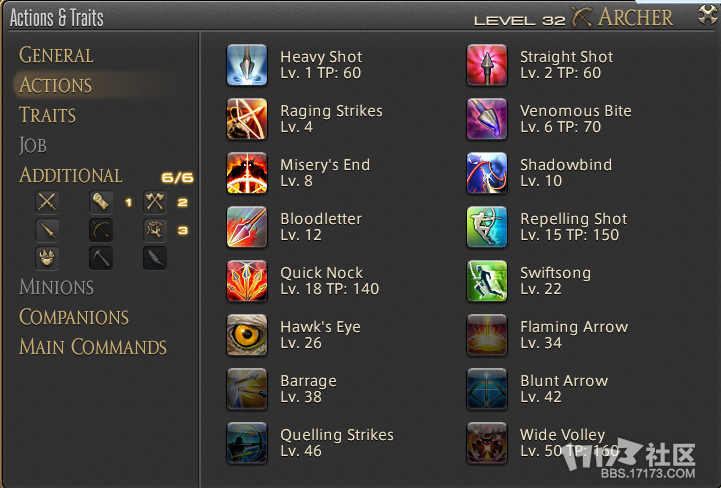 Five: Misery ‘s End: the GCD skills, direct damage skills, skills damage for 180 (seems to remember is this value), the conditions of use target HP below 20%. Six: Shadowbind: control skills, skills to explain translation should be making them fear, for 10 s, but the actual effect seemed to make the target in place, don’t know whether I fear set in place. Any damage will cancel effect. Seven: Bloodletter: the GCD skills, direct damage skills, skills damage by 150, the conditions of use. Eight: Repelling (beat) Shot: professional level 15 professional task after get the rewards. Effect is targeted at the same time its distance to the rear jumps end. Skill 9: Quick Nock: AOE skill, the effect is damage to all enemies in front of the fan area must have goals, an observer-based cutting force. Skills: ten Swiftsong: singing poems to make the movement speed increase of all players, at the same time there can only be a poetry effect and battle damage will disappear. Eleven: Hawk ‘s Eye: BUFF skill, increases 20 accuracy within a certain time, cooling time 90 s.
Enough rest skills due to the level are not so I can’t tell. And passive skills such as increasing range and damage and so on. As a DPS career, can hit the high DPS is the most important thing that there is no doubt. Continued to hurt hands held Strikes, Straight Shot crit buff, and then use both Venomous Bite and Heavy Shot to make the public skills CD into the CD, and then use the Heavy Shot filling, if trigger a Straight Shot effect, use Straight Shot, but also to ensure the buff, damage over time effect, use skills depending on their own fighting for rhythm, it’s difficult to say.